2. The Defense line up near the goal (triangles). 3. On the whistle forward #1 skates with the puck to the farthest cone. 2. Defense focus on transition to backward skating, speed and pushing player away from net. They should not allow the O to get to the net. 3. Goalie should be working on being in position and moving with the play. 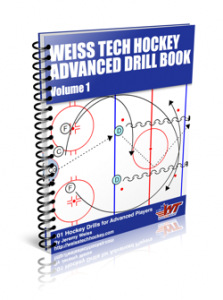 This drill can be changed up to be a 2 on 1 or 2 on 2. A lot of variations and the kids love competitive drills like this. You could also just have the Offense skate up around and work on carrying the puck and making the turn.